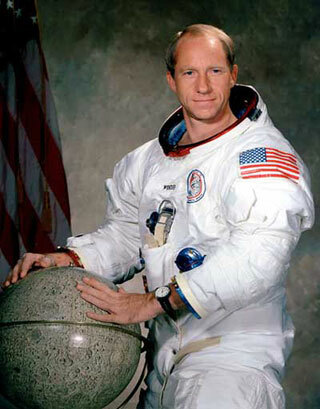 Al Worden served as Command Module pilot on the 1971 Apollo 15 moon mission, during which he orbited the moon and took a space walk 200,000 miles from Earth. Worden was born February 7, 1932, in Jackson, Michigan. He received a Bachelor of Science degree in military science from the U.S. Military Academy in 1955 and Master of Science degrees in astronautical/aeronautical engineering and instrumentation engineering from the University of Michigan in 1963. After graduation from the Military Academy, he was commissioned in the U.S. Air Force and received flight training at Moore Air Force Base, Texas, and Tyndall Air Force Base, Florida. He served as a pilot and armament officer with the 95th Fighter Interceptor Squadron at Andrews Air Force Base, Maryland. In 1965 he was graduated from both the Empire Test Pilots School, Farnborough, England, and from the Aerospace Research Pilots School in California. He was an instructor at the latter when NASA selected him as one of 19 new astronauts in April 1966. Worden was backup Command Module pilot on Apollo 12 before being named to the prime crew of Apollo 15, along with Commander David Scott and Lunar Module pilot Jim Irwin. The trio blasted off on July 26, 1971, and Worden orbited the moon alone for three days in the command ship “Endeavour” while Scott and Irwin explored a mountainous region on the edge of the Mare Imbrium, driving the first Lunar Rover on the surface. During this “lonesome” period, Worden remotely photographed the moon’s surface with two special cameras mounted outside the ship. On the homeward journey, Worden took the farthest-out space walk, moving along handrails on the outside of “Endeavour” to the rear of the ship to retrieve film cassettes from the two moon-mapping cameras. The stroll, 200,000 miles from Earth, was necessary because the Service Module section to which the cameras were mounted would be jettisoned to burn up before reentry into Earth’s atmosphere. Following Apollo 15, and before retiring in 1975 from NASA and from the Air Force as a colonel, Worden was senior aerospace scientist and later chief of the Systems Studies Division at NASA’s Ames Research Center in California. Before his retirement from the business world in 1996, Worden held executive positions with Jet Electronics and Technology, Inc., and with BF Goodrich Corp. He lives in Vero Beach, FL. Worden is a former Chairman of the Astronaut Scholarship Foundation. Al Worden was inducted into the U.S. Astronaut Hall of Fame on October 4, 1997.